It’s my foot. It’s OK, as feet go – you’re not getting the worst of it in a photo, as it’s real downside is the smell, not what it looks like. It has a tough, tough toenail on my big toe that is increasingly difficult to cut through, even using my father’s cast-off, heavy-duty chiropody shears. They are not quite as blistered as perhaps they ought to be at this stage in a campaign in which I am foot-soldier. There’s something funky going on underneath my toes that leads to dead skin sloughing off periodically, and, as I said, they smell bad. And you didn’t need to see them on my blog, and you didn’t need to read the description either. Any more than you needed to read in the Daily Mail about the Prime Minister’s wife’s feet. I’m not linking the story because I don’t want to encourage them. The story is a disgrace – Sarah Brown went to a beautiful Hindu temple which required her to remove her shoes. The Daily Mail took a photo of her feet, then blew it up to enormous size and criticised the location of her little toe. Which no-one would have taken the slightest notice of if they hadn’t printed it in a big close up. And if that wasn’t bad enough, they then speculated on whether the Prime Minister’s missus’s toe problem is enough to give the Leader of the Opposition’s wife the edge. 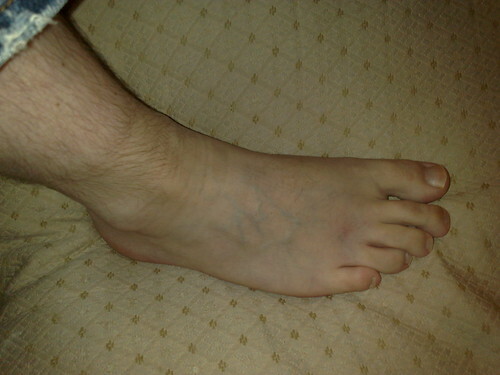 [S]he unveiled a rather unsightly problem on her left foot – her little toe and fourth toe crossed over one another. She has been placed in direct competition with David Cameron’s wife Samantha, and this will do little to boost her credential’s against ‘SamCam’. In fact, it’s the kind of sight that will immediately put the Prime Minister’s wife into second place behind the Tory leader’s wife. ARE YOU KIDDING ME?? What the hell do these people think general elections are about? This story is an absolute disgrace! There are any number of reasons why the Prime Minister’s wife has a food that looks like that. She could have been born with it. She could have spent her life cramming her feet into the kind of stupid shoe that the Daily Mail thinks is what women ought to wear. She might have had some hideous foot accident that left her lucky to have what she has or she could have spent her childhood in painful surgery to get as far as having nothing worse than a slight overlapping toe issue. In any case, IT’S NONE OF OUR BUSINESS. IT’S NOT REMOTELY RELEVANT. TO ANYTHING. NO-ONE WITH HALF A BRAIN SHOULD CARE. IT HAS NO BEARING ON POLITICS, THE ELECTION, CURRENT AFFAIRS, WHO RUNS THE COUNTRY OR ANYTHING – ANYTHING -ANYTHING OTHER THAN WHAT SARAH BROWN CHOOSES TO PUT ON HER FEET. EDIT – Cllr Foster has had a slight aneurysm and has been removed to a place where he is not a danger to himself or others. He will be allowed back at the blog once the frothing at the mouth subsides.